The Included Headphones are of decent quality and appear to have good bass output for such a small headphone, but whether you decide to use them or upgrade to a better set depends on your listening tastes. The provided pair are definitely a good start and such appease most users. The Zen utilizes the USB 2.0 standard so transfers are about as quick as the iPod with a similar USB port. I had a Firewire iPod and can't really say that it was much faster than the Zen but I don't have any data to support my comments. The top of the Zen has the required Headphone jack (which is located in the middle) it can also accommodate a wired remote that is sold as an accessory on the Creative site. On the left side is the Power/Lock switch which allows you lock the device to avoid you accidentally hitting any controls. On the right side is the Mini USB connector which serves double duty as the method of charging the device and transfer files. The USB cable allows you to charge the device while downloading music and the wall-wart adapter also charges through the same port. A nifty feature that tells you it's charging is the funky glow that fades in and out as it charges. Finally on the far right a small hole is where the integrated microphone is hiding. A lot of information is displayed on the LCD screen of this player. It tells you the song name, artist and from which CD the MP3 came (assuming your ID tags are correct). It also displays a counter. When used the Zen's LCD lights up a pale blue, and the menus of the Zen Micro are easy to use. You can scroll through your play list by using the vertical touch pad. Confirming something needs to be done by gently touching the touch pad. I found the touch pad easy to use, others may find it over sensitive, thankfully Creative allows you to adjust the sensitivity of the touch pad in the system settings menu. There are also a few other buttons on this player. (from left to right) 'Previous track', 'Play/pause' and 'Next track' button. Under these there is a ‘Back’ button and a ‘Menu options’ button which is easily recognized as it looks the same as a windows menu icon. After using the iPod's interface and the Zen's I can say both are user intuitive and I have no issues or complaints using either one both are intuitive and simple to use while offering a depth of system settings and the obvious equalizer settings, Creative throws in quite a few pre-configured presets for you to play with. 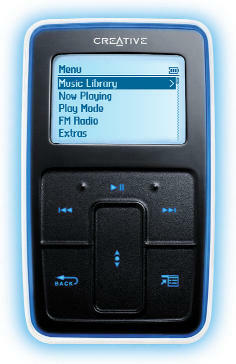 One of the other features of the Zen Micro is the ability to listen to FM-radio. I wasn't looking for this feature but I may even use it more than one time to ensure it worked. The Zen is able to store up to 32 presets which you can custom name, it scans for radio stations but this didn’t work well as some of the stations it picked up were unlistenable due to excessive noise. I don't imagine this is a huge issue but I found it annoying that you need to go through all 32 stations before returning to the first preset, a feature to only preset the stations you want should have been included. Another neat feature is is the ability to use the Zen as a 'Personal Audio Recorder', by using the ADPCM compression it should allow close to 10 hours of recording time (if your drive is empty). The Zen Micro lets you set an 'Alarm' to wake you to your favorite play list, I can't see it replacing many Alarm clock but its a nice feature to have when taking a quick snooze somewhere. There's now a feature that allows the Zen Micro to act as a USB 2.0 hard-drive, but you first have to activate the feature in the Micro's 'Extras menu'. You can select a partition size (128MB up to 2GB) then the Zen Micro formats the partition. The partition can be resized without losing any files on the existing partition. You won't be able to access any of your music stored on the Zen when it's in 'Hard-drive' mode, but you also don't need a special driver, it uses the Windows USB Mass Storage driver and functions as a portable hard-drive. The included software allows you to Sync the Zen Micro with Outlook and you can then view your 'Calendar' and 'Contacts' right from the Zen. I have mixed feelings about the software but it allows you to accomplish whatever task is at hand so I can't complain to much about that. Once this is done you can access the Zen right from Windows Explorer and drag and drop files directly to the Zen Micro. The other route is to use the Creative Zen Explorer which has options to 'Sync' your music to certain folder(s) you designate. This a welcome change over iTunes which crashed more often than not and mangled my play lists. I ended up purchasing a Third-party solution called Anapod from Red Chair software they also produce a product called Notmad for the Zen Micro which has some neat features including a claim of 20% faster transfers than the Creative software, its also free for the basic version so give it a try. Well that's about all I can think of for now, so let's end this by stating that the Zen Micro compares pretty well against the iPod Mini and offers a full Gig of extra storage and an FM tuner. I've used mine for a month and can't find anything negative to say. I shouldn't need to purchase a new Mp3 player until the Zen Micro Photo is released!